Bibimbap (/ˈbiːbɪmbæp/ BEE-bim-bap, from Korean 비빔밥 [pi.bim.p͈ap̚], literally "mixed rice"), sometimes romanized as bi bim bap or bi bim bop, is a Korean rice dish. The term “bibim” means mixing various ingredients, while the “bap” noun refers to rice. Bibimbap is served as a bowl of warm white rice topped with namul (sautéed and seasoned vegetables) and gochujang (chili pepper paste), soy sauce, or doenjang (a fermented soybean paste). A raw or fried egg and sliced meat (usually beef) are common additions. The hot dish is stirred together thoroughly just before eating. In South Korea, Jeonju, Jinju, and Tongyeong are especially famous for their versions of bibimbap. In 2011, the dish was listed at number 40 on the World's 50 most delicious foods readers' poll compiled by CNN Travel. The exact origin of bibimbap (비빔밥) is unknown. People could have started mixing bap (rice) with banchan (side dishes) after the outdoor jesa (rites), such as sansinje (rite for mountain gods) or dongsinje (rite for village gods), where they needed to "eat with the god" but did not have as many cooking pots and items of crockery to hand as they would normally have at home. Some scholars assert that bibimbap originates from the traditional practice of mixing all the food offerings made at an jesa (ancestral rite) in a bowl before partaking of it. Bibimbap was recorded as hondon-ban (混沌飯) in the history book Historical notes of Gijae by the Joseon scholar Bak Dong-ryang (1569–1635). In the Diary of Cheongdae by another Joseon scholar Gwon Sang-il (1679–1760), it was recorded as goldong-ban (骨董飯). The dish was also recorded in Complete Works of Seongho by Yi Ik (1681–1764) as goldong (骨董), in Complete Works of Cheongjanggwan by Yi deok-mu (1741–1793) as goldong-ban (汨董飯), and in Works of Nakhasaeng by Yi Hak-gyu (1770–1835) as both goldong-ban (骨董飯) and goldong (骨董). The hangul transcription beubwieum (브뷔음) first appears in the 1810 encyclopaedia Mongyupyeon by Jang Hon. The 1870 encyclopaedia Myeongmul giryak states that the dish name is written as goldong-ban (骨董飯) in hanja but is read as bubaeban (捊排飯), a probable transcription of the native Korean bubim-bap (부빔밥). In Collected Works of Oju written by Yi Gyu-gyeong (1788–1856), recorded varieties of bibimbap, such as vegetable bibimbap, miscellany bibimbap, hoe bibimbap, shad bibimbap, prawn bibimbap, salted shrimp bibimbap, shrimp roe bibimbap, marinated crab bibimbap, wild chive bibimbap, fresh cucumber bibimbap, gim flake bibimbap, gochujang bibimbap, soybean sprout bibimbap, and also stated that bibimbap was a local specialty of Pyongyang, along with naengmyeon and gamhongno. The first known recipe for bibimbap is found in the Siuijeonseo, an anonymous cookbook from the late 19th century. In the late 20th century, bibimbap started to become widespread in different countries, due to its convenience of preparation. Many airlines connecting to South Korea began to serve it, and it was accepted more globally globe as a popular Korean dish. It has also been described as a symbol of migration by non-Koreans to Korea as Korea becomes a more multicultural country. Vegetables commonly used in bibimbap include julienned oi (cucumber), aehobak (courgette), mu (radish), mushrooms, doraji (bellflower root), and gim, as well as spinach, soybean sprouts, and gosari (bracken fern stems). Dubu (tofu), either plain or sautéed, or a leaf of lettuce may be added, or chicken or seafood may be substituted for beef. For visual appeal, the vegetables are often placed so adjacent colors complement each other. In the South Korean version, sesame oil, red pepper paste (gochujang), and sesame seeds are added. The Bibimbap meal includes meat, rice, sesame oil, vegetables, as well as gochujang which are presented as a single dish and eaten with chopsticks and spoons. The meal provides unique nutrition and flavor fused with attractive colors due to its rich ingredients. Furthermore, the ingredients have low calorie content, hence offer a healthy diet. The combination of vegetables, rice, fermented sauces and meat provides adequate fiber, carbohydrates and protein content. By harmonizing together various ingredients, bibimbap emerges as a unique meal that symbolizes the harmony and balance in the Korean culture. Hot stone pot bibimbap (dolsot-bibimbap (돌솥 비빔밥)) is a variation of bibimbap served in a very hot dolsot (stone pot) in which a raw egg is cooked against the sides of the bowl. The bowl is so hot that anything that touches it sizzles for minutes. Before the rice is placed in the bowl, the bottom of the bowl is coated with sesame oil, making the layer of the rice touching the bowl cook to a crisp, golden brown (누릉지). This variation of bibimbap is typically served to order, with the egg and other ingredients mixed in the pot just prior to consumption. Hoedeopbap (회덮밥) uses a variety of raw seafood, such as tilapia, salmon, tuna or sometimes octopus, but each bowl of rice usually contains only one variety of seafood. The term hoe in the word means raw fish. The dish is popular along the coasts of Korea where fish are abundant. The city of Jeonju (전주), the capital of the North Jeolla Province of South Korea, is famous throughout the nation for its version of bibimbap, said to be based on a royal court dish of the Joseon dynasty. Yakcho-bibimbap(약초비빔밥) is from Jecheon. Jecheon is a great place for medicinal herbs to grow. People could get a thicker root and more medicinal herb than other areas. The combination of the medicinal herbs and popular bibimbap made it one of the most popular foods in Jecheon. Bibimbap ingredients are rich in symbolism. Black or dark colours represent North and the kidneys – for instance, shiitake mushrooms, bracken ferns or nori seaweed. Red or orange represents South and the heart, with chilli, carrots, and jujube dates. Green represents East and the liver, with cucumber and spinach. White is West or the lungs, with foods such as bean sprouts, radish, and rice. And finally yellow represents the centre, or stomach. Foods include pumpkin, potato or egg. ^ a b c d e f g h "주요 한식명(200개) 로마자 표기 및 번역(영, 중, 일) 표준안" [Standardized Romanizations and Translations (English, Chinese, and Japanese) of (200) Major Korean Dishes] (PDF) (in Korean). National Institute of Korean Language. 30 July 2014. Retrieved 15 February 2017. Lay summary. ^ "bibimbap". OxfordDictionaries.com. Retrieved 8 January 2017. ^ a b c "Organic Vegetables Bibimbap". Seoul Metropolitan Government. Archived from the original on 1 October 2011. ^ Chung, Kyung Rhan; Yang, Hye-Jeong; Jang, Dai-Ja; Kwon, Dae Young (2015). "Historical and biological aspects of bibimbap, a Korean ethnic food". Journal of Ethnic Foods. 2 (2): 74–83. doi:10.1016/j.jef.2015.05.002. ^ Cheung, Tim (7 September 2011). "Your pick: World's 50 best foods". CNN. Retrieved 12 April 2015. ^ 황혜성 (1995). "비빔밥". Encyclopedia of Korean Culture (in Korean). Academy of Korean Studies. Retrieved 13 January 2019. ^ Choe, Sang-Hun; Torchia, Christopher (September 2007). Looking for a Mr. Kim in Seoul: A Guide to Korean Expressions. Master Communications, Inc. p. 168. ISBN 9781932457032. Retrieved 31 July 2016. ^ "Rice with Leftovers (1st Lunar Month)". Archived from the original on 17 April 2015. Retrieved 8 April 2015. ^ Bibimbap Globalization Foundation. "Origin of bibimbap". Bibimbap Globalization Foundation. Retrieved 6 March 2019. ^ "Origin of Bibimbap". Bibimbap Globalization Foundation. Retrieved 12 April 2015. ^ Yu Gu, So (1966). Limwon-sipyukji (林園十六志). Korea: Sŏul Taehakkyo Kojŏn Kanhaenghoe (서울大學校古典刊行會). ^ a b c 황광해 (17 August 2016). "[황광해의 역사속 한식]비빔밥". The Dong-a Ilbo (in Korean). Retrieved 13 January 2019. ^ a b 황광해 (11 October 2018). "[이야기가 있는 맛집(344)] 비빔밥②". Weekly Hankook (in Korean). Retrieved 13 January 2019. ^ a b c d 신지훈; 권대영 (2 October 2015). "비빔밥의 기록은 시의전서가 최초?". 식품외식경제 (in Korean). Retrieved 13 January 2019. ^ Koo Chun-sur. "Bibimbap: High-nutrition All-in-one Meal". The Korea Foundation. Archived from the original on 7 March 2012. ^ 비빔밥. Encyclopedia of Korean National Culture (Empas) (in Korean). Retrieved 6 December 2006. ^ 전주비빔밥. Jeonbuk Food Culture Plaza (in Korean). Retrieved 6 December 2006. ^ a b c Jang, Dai Ja; Lee, Ae Ja; Kang, Soon-A; Lee, Seung Min; Kwon, Dae Young (2016). "Does siwonhan-mat represent delicious in Korean foods?". Journal of Ethnic Foods. 3 (2): 159–162. doi:10.1016/j.jef.2016.06.002. ^ Shen, Shawn (2017). "The Bibimbap Migration Theory? Challenges of Korea's Multicultural Mix and Social Integration Development". Journal of International Migration and Integration. 18 (3): 771-789. ^ "전주-비빔밥 (全州---)". Standard Korean dictionary (in Korean). National Institute of Korean Language. Retrieved 7 February 2017. ^ "What Makes Jeonju Bibimbap So Special". The Chosun Ilbo. 22 February 2010. Retrieved 20 June 2017. ^ a b "Health Secret of Korea's Bibimbap, Prepared to Perfection". Korea Tourism Organization. 18 September 2016. Retrieved 20 June 2017. ^ "진주-비빔밥 (晉州---)". Standard Korean dictionary (in Korean). National Institute of Korean Language. Retrieved 7 February 2017. ^ Hong Mi-Kyung (19 May 2008). "Top 10 Korean Dishes & Restaurants". Korea Tourism Organization. Retrieved 12 April 2015. ^ "약초비빔밥". korean.visitkorea.or.kr (in Korean). Retrieved 24 April 2018. ^ "The Beginner's Guide To Bibimbap". Sous Chef. Speciality Cooking Supplies Limited. 18 September 2014. Retrieved 12 April 2015. 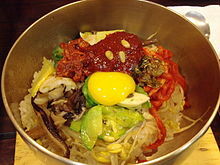 Wikimedia Commons has media related to Bibimbap.